Both pixel art and platformers are very well represented on Switch right now. Whether it's indie darlings such as Shovel Knight: Treasure Trove and Super Meat Boy, or third-party mascots Sonic and Rayman. Jumping, running and combat feel as ubiquitous to the system as the legendary first-party side-scrollers of yore, at least until Mario gets bored of his globe-trotting antics and returns to the two-dimensional Mushroom Kingdom. Next in an increasing line of retro inspired titles comes A Hole New World from Dolores Entertainment and MadGearGames. Playing as a mysterious cloaked hero, you are trying to save Versee from the evil Lord Baduk and a slew of mythical demons, beasts and other such nastiness across half a dozen themed stages. To restore peace and harmony you must also slay the huge end of level bosses and acquire a set of magical potions to use to complete your quest. 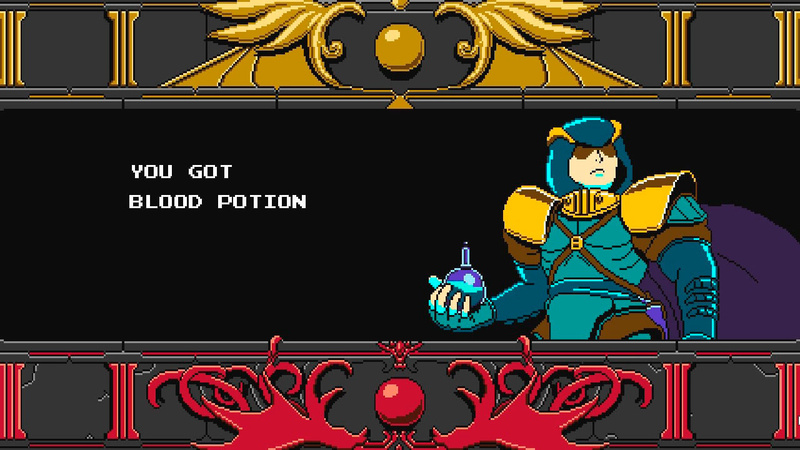 These potions can be switched on the fly with a press of the trigger buttons. 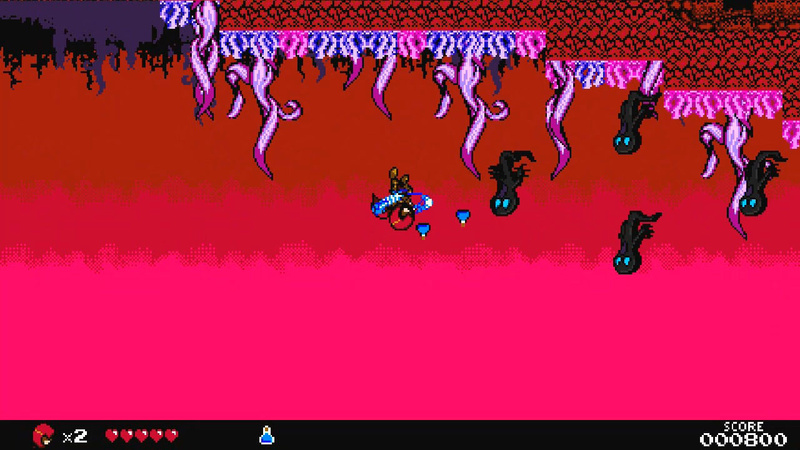 The controls are very simple to grasp, but the trajectory of throwing the potions will take some practice, especially when taking on fast moving enemies or during boss fights. While the story is pretty derivative and negligible, the game does try to employ a few presentation and mechanical hooks to make it stand out from the crowd. First of all, in attempt to subvert (more more fittingly, invert) the age-old genre trope of avoiding gaps so as to not plummet to your doom, AHNW's main crux is exactly the opposite. Falling down a hole to enter the dark world is unfortunately not so much encouraged but necessary to progress, as there aren't any alternate paths or many secrets to discover, save for increasing your score by collecting crystals or regaining health by eating chicken drumsticks. You'll go between the 'regular' world and the 'dark' world where you continue your adventure with opposing gravity, a moodier colour palette and more vicious creatures to take out. When it works well, alternating between the two to traverse platforms and dodge environmental hazards is a satisfying test of timing and skill, it's just a disappointment that with the tease of a portal like reliance on momentum, there isn't much in the way of puzzle ideas or secret areas to explore. 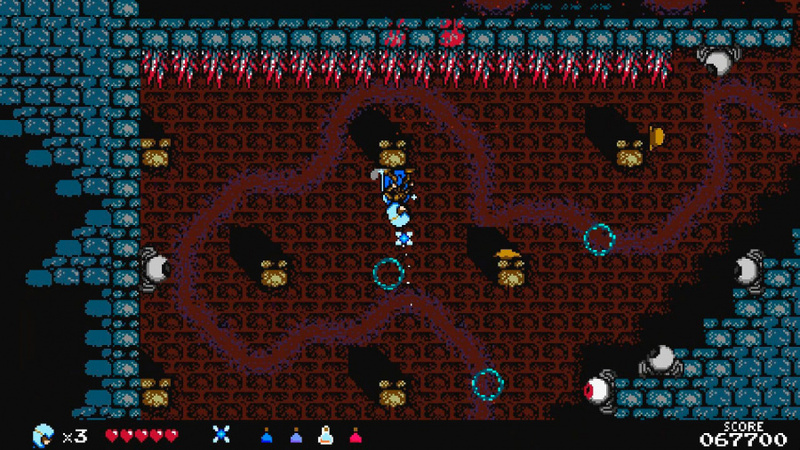 For as faithful as it is to the NES era of challenging side-scrollers such as Ghouls 'N Ghosts, the parallax scrolling and effects are accomplished. The environments are detailed, animations are smooth and even though the bosses do employ the traditional methodology of studying limited attack patterns, they are pretty impressive in size and variety, if not quantity. Likewise, the rich and catchy chiptune soundtrack is solid and each track fits the environment well. Unfortunately, it's almost too faithful to the era, as we experienced intermittent framerate stutters that were inconsistent with the nature of the action on screen. Curiously, it would hold up well during more chaotic action, but chug in the aftermath. 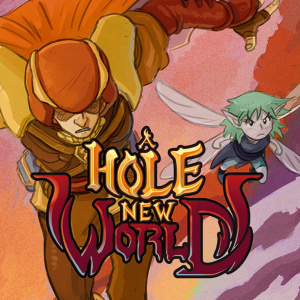 As with other retro inspired titles (and in fact proclaimed by the developers), A Hole New World has a degree of difficulty that some would call old school, but others might just call unfair. The lives system has been rejigged a little, as quite generously spaced checkpoints or being revived by your fairy companion deceivingly make proceedings more manageable. It isn't long before frustration sets in, as you'll be bombarded with swooping bats that are barely distinguishable from the dark background, ambushed by lightning-quick pouncing wolves, or even just zapped by lightning, all while hordes of lumbering monsters take several well-timed hits to take down. It can become an exercise less in strategy or skill, but just taking a hit, being temporarily invincible and running for your life. In line with more modern trends, there is a new game plus mode, boss rush, challenges and multiple endings to stretch out the initial hour or two play time. This has nothing to do with Aladdin. I thought the concept was really neat since it bucks the traditional pitfalls are bad. However it sounds like it was not executed very well. I may still pick this up but at a later time. Just don't have the time or energy nowadays for punishingly unfairly hard games. Seem to be quite prevalent nowadays. To be fair, i haven't spent enough time with it to TRULY give an opinion, but what I CAN say is that I've tried to sit down with this game on 3 occasions since I downloaded it. On all 3 occasions the end result was pretty much the same: quitting due to frustration at the super annoying bats and enemy movement causing me to get hit constantly. I really want to like it, and maybe I will, but for now it's hanging out in like row 7 while other things get all the love. Bit of a shame it didn't turn out better. Back to Rad Gravity it is then! With the plethora of amazing, retro style platformers on the Switch, a middle of the road 6 is not enough to make me consider buying. This game isn't easy but not quite as difficult as the review implies. Its not harder than Ghosts 'n Goblins or Castlevania. It will be enjoyable to you if you enjoy the 2 games I mentioned. It has a mild Megaman vibe also. I'd probably give it a 7 but everyone will have a different opinion. Thanks for the review! I agree with the overall grade - 6 is adequate. I bought the game on Friday and beat it in a single go of about 2 hours. If you're used to NES classics then I don't think you'll find the game difficult. For the most part, it's actually amazingly simple and easy and the only part I can say actually gave me trouble was the final boss. Once I remembered I've got a jump kick, it took me 7-8 tries to beat him. The game is super forgiving actually, with its respawns where you died and continues that actually send you to a checkpoint and not the beginning of a level. The graphics, music and animations are nice. The level design is where the game fell short for me, the upside-down concept was underutilized. For the above mentioned crashes - the game never crashed on me, but the unlocked "Challenge Mode" seems buggy. If I want to play a classic 8 bit title, I will play a classic 8-bit title. Pass. The review fails to mention that the game is GLITCHY as heck. First of all, Challenge mode is not playable, once you enter it, your controllers (joy-con in handheld mode in my case) stop working in the game. So the only thing you can do is quit the game. I mean, how hard would it have been to just test this mode? Also, the collect-o-thon counters (for gems, npc, enemies, etc...), it only works if you do one playthrough without ever continuing. If you ever continue, or worst, quit the game and reload your save, all the counters will be screwed (just activated the completionist option, and quit the game after you beat a stage, you'll see what I mean). So trying to finish this 100% is basically impossible. Maybe it was a good game on Steam, but on Switch, the only thing that works is the base game, and this is a 2 hours experience. So I would so to avoid until the developper release a patch. In its state, I regret buying this.